PHOTOMOD is a digital photogrammetric system allowing the user to obtain metrically precise spatial data on the basis of commercially available imaging systems, such as frame digital and film cameras, space scanning systems of high resolution, and synthetic aperture radars. • Spatial aerial triangulation : The functions of the aerial triangulation in PHOTOMOD are required to accurately calculate the orientation parameters of images and provide a high geometrical accuracy of the output products: DEM, orthomosaics, digital maps. Arial triangulation results (orientation parameters) are calculated automatically and the system provides a full range of tools for accuracy evaluation, visual control and errors analysis. 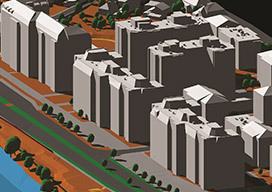 • Digital terrain models : PHOTOMOD allows the user to automatically create digital elevation models and digital surface models from aerial and satellite images. 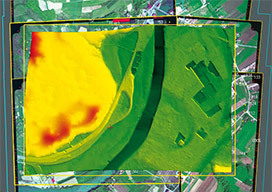 The digital terrain model created in PHOTOMOD ensures high quality of orthomosaic, and also serves as a source of detailed information about terrain relief and is used to solve analytical tasks. • 2D and 3D-vectorization : The PHOTOMOD system supplies the user with a full set of tools for 2D and 3D-vectorization and editing of drawn terrain objects. You may use vectorized objects as a topographic basis of cartographic production or input them as initial data to create mathematic (geometric) model scene during terrain 3D modeling. • Orthorectification and mosaic creation : During mosaic creation using PHOTOMOD tools you can build continuous, color balanced and brightness homogenous orthomosaic with high accuracy from separate images. Geometric and photometric distortions are adjusted during the creation operation. 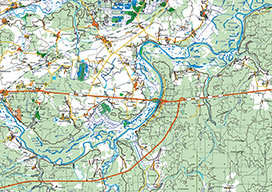 Output product (orthomosaic) could be presented as a single frame or a set of sheets in specified cartographic projection with marginalia. • 3D-modeling : The PHOTOMOD software package includes features for creation of 3D models using stereovectorization results. The resulting model, due to the high quality metric may be used for solving applied analytical problems. And thanks to the visual appeal and clarity they may be useful when creating a vivid and compelling multimedia resentations and videos. 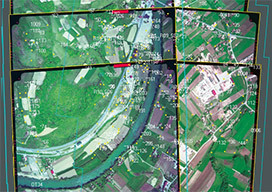 • Map making : The PHOTOMOD delivery set includes GIS-application – GIS Panorama 2011 Mini used for mapmaking purpose. 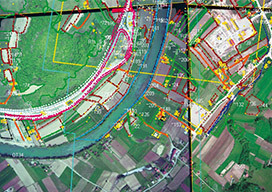 The application is used for the creation, editing and printing of digital maps and city plans for different purposes, databases administration with setup of custom forms for viewing tables, creating queries and reporting to view territory planning schemes, urban cadastre and other problems. Racurs company has 20 years long history of success on Russian and worldwide geoinformatics market. 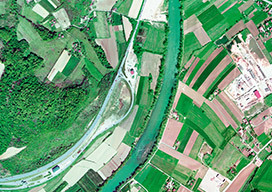 Since its foundation in 1993 our company has been developing an innovative digital mapping software for processing aerial, space and terrestrial imagery. Racurs’ flagship product PHOTOMOD was one of the first digital photogrammetric systems on the market that was designated for working on off-the-shelf PCs.